* watching my world slowly warm up from the first cold crispy frost last night. I woke up cold in the night, now I know why! There will be extra layers on tonight. * wanting to connect back here again, after slightly losing my way. * hoping the desperately needed aid reaches the people in the Phillippines. * deciding that today I will practise asking people 'and how are you today?' in a way that sounds like I mean it. 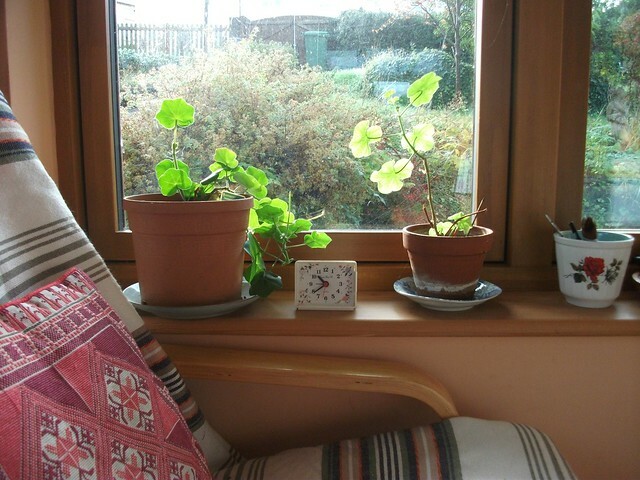 * feeling glad I remembered to bring in the Geraniums before the frost. * wanting to find a way forwards for my teenager who is now at home. Can I really teach science. * wondering what happened to the little green pea planet called Pluto, which seems to have disappeared from the now 8 planet solar system! did I miss something. * trying to make my mind move forwards out of my inertia. We can live life in a way that works for us. Even if it's not the norm. * looking forward to finishing my new blanket, my knees are cold! I will show you more soon. …I'm ready to go to bed now!!!! Today has been lovely, because of a lovely chit chatting at lunch with an old friend of mine!!!!! And, of course, some crocheting!!! Philippines are not far away from here…….so sorry for all the people over there…..
Pluto is no more a planet….science is no more the same stuff we used to know!!!! yes pluto was downgraded a few years back! ps at least the cold means our quilts get used, there is a purpose for making them! Sending you hugs .Making ripple bankets in winter is great,keeping you warm as you hook! I'm not too bad, thank you so much for asking Heather... I am with you on the Philippines, I used to live on Guam, and I have to say that when you're out in the Pacific on an Island you feel a bit desolate to start with. The answer is YES, you can teach Science. Are you planning on homeschooling? If you are, and if you ever need any sort of support... I'm here for you, I also know countless teachers and many families that home school... IF that is your plan, I wish you well... I know so many successful stories. I'm fine, thank you, Heather. And how are you today? :-) I cannot get my mind around the suffering in the Phillipines. It's too hard to comprehend. On a much more cheerful note, I am looking forward to seeing your blanket! I like asking people how they are, really I do, but since learning that 'comment ça va' derives from the original sixteenth-century question 'how is your intestinal transit faring' I feel a little strange asking people that! Weird, right? Love your blog! I found you via Ted and Agnes, following you now. Yes, you can teach Science, with a good text book, the Internet, and anything by Brian Cox makes it all crystal clear! Good luck! Yes, the Pluto thing was a what-the-heck moment for me too when I heard about it. I'm new to your blog and am enjoying catching up. That cozy window-corner alone is lovely.